The Taylor K14ce Builder’s Edition acoustic-electric guitar is a sublime expression of the luthier’s art. This gorgeous Grand Auditorium features Hawaiian koa back and sides paired with a torrefied Sitka spruce top. The guitar was inspired by Taylor’s revolutionary V-Class bracing, which boosts volume evenly across the tonal spectrum, increases sustain, and improves the natural intonation of the instrument by creating a more synergistic response from the soundboard. This fosters a more harmonious relationship between the notes you play, helping chords to ring out in cohesive splendor. V-Class bracing changes all that. 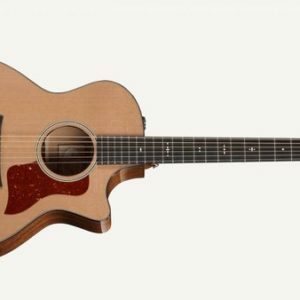 With Taylor’s V-Class bracing, an acoustic guitar top can be both stiff and flexible — for more volume and sustain. V-Class bracing provides stiffness parallel to the strings for more rigidity and hence sustain. Flexibility on either side generates the air movement necessary for robust projection. It’s the best of both worlds. This groundbreaking innovation also improves intonation; not only producing notes that are louder and with longer sustain — but more in tune with each other. Guitarists at Kenny’s Music are gobsmacked. But don’t take our word for it — pick up the superb Taylor K14ce Builder’s Edition and experience it for yourself! Another Builder’s Edition design element is enhanced playing comfort in the form of new ergonomic body contours. These include a beveled armrest and body edge binding along with a reshaped Venetian cutaway that flows smoothly into the heel and incorporates a finger bevel where the cutaway meets the soundboard. This creates a smoother path to the upper register for your fretting hand. Other notable refinements include a new Silent Satin finish that helps dampen incidental sound against the guitar body, a black graphite nut that reduces string friction, and a stunning new Kona burst that highlights the natural beauty of the guitar’s figured koa back and sides. Inset koa/paua top and back trim add a beautiful sparkle that complements Taylor’s new Spring Vine fingerboard inlay. With this K14ce, Taylor has attempted to design and build the ultimate player’s guitar. They succeeded beyond our wildest dreams. We think you’ll agree! 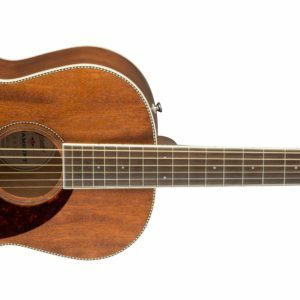 Taylor’s beloved Grand Auditorium body style, featured on the K14ce Builder’s Edition, employs the width and depth of the Dreadnought. However, its waist is narrower, which gives Grand Auditorium guitars a sleeker look, and more treble zing. The K14ce’s Grand Auditorium body style helps to sharpen the definition of each note, balancing out nicely with the excellent projection of its Koa top. And now Taylor takes the Grand Auditorium to the next level of performance with V-Class bracing. For the K14ce’s sides and back, Taylor uses a very special tropical hardwood sourced from Hawaiian plantations above 5,000 feet. Koa’s sonic alchemy combines the focused midrange of mahogany with the snappy high end of maple. Kenny’s Music tip: Due to the wood’s density, koa guitars tend to start out sounding a bit bright; it’s similar to maple in this regard. But the more you play your koa guitar, the more the tone opens up, expanding the midrange and rewarding you with sweeter, richer, more resonant sonority. Often times, guitarists unfamiliar with the tonewood purchase a koa guitar for its stunning visuals, don’t play it enough to allow the wood to warm up, and mistakenly conclude that it’s too bright. Fine koa guitars like the Taylor K14ce deserve to be played every day! With that said, koa’s inherent brightness is ideal for finger pickers with a meatier touch and for studio layering where you need an acoustic guitar that cuts through the track. If you play plugged-in, you’re going to love the Taylor Expression System 2 (ES2) electronics onboard your K14ce Builder’s Edition. The key to this fantastic system is the 3-section proprietary pickup located behind the saddle. Because of where it’s positioned and how it’s integrated into the K14ce’s saddle, the ES2 pickup provides you with remarkably clear and accurate sound. In addition to a master volume control, a pair of tone controls lets you tweak your highs and lows to get the sound you need, and a discreet polarity switch offers vital onboard feedback suppression.